One of the best bookstores in Bologna is Giannino Stoppani, which is bang in the middle of the city, not far from the Neptune statue, and specialises in children's literature. 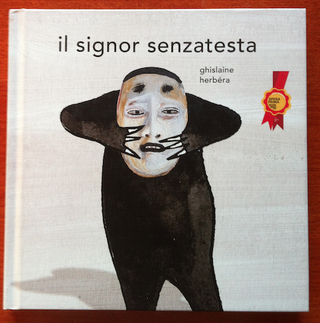 It is there that I came across Ghislaine Herbera's Monsieur Cent Têtes (Mr. Hundred Heads), known in Italy as Il signor senzatesta (Mr. No-Head). It's the story of a small headless monster who keeps a collection of 99 heads in a huge wardrobe (and a moose's skull mounted on his house's otherwise bare walls), and puts every single one of them on (moose skull included) as he tries to figure out which one would work best for his upcoming Big Date—except, rather than a simple case of "this mask's too big, this one's too small", the masks end up reflecting his many mood changes as he veers from nervousness about the date to self-doubt to excitement and joy. Each mask is part of folk traditions somewhere or other, from Japanese Noh theatre, to Asmat "mud men" masks from Melanesia, to commedia dell'arte stuff from Italy, to the many (obligatory) African masks—and there's an appendix at the end with the tradition or ethnic group each mask is associated with, and its geographic origins. The ending is slightly cheesy. And perhaps a meatier appendix, with more information on the masks' cultural context, would have been better. But it's such a fun idea, and rendered so joyfully, that I would not hesitate it to give it to a hypothetical son or daughter.